This project would not have been possible without the hundreds of schools, businesses and families who sent us hands and the volunteers in Newtown. Check out our contributor page to find out who made it happen. A note to all who sent hands: Each and every delivery touched our hearts. Your letters are in a binder which will be kept in Sandy Hook School so that teachers and parents may have the chance to read your words of comfort, love and support. I am amazed at the Helping Hands still pouring in from all over the country. I want you to know that EVERY envelope and box is being opened, every letter and card is being saved and included in an album, and every contributor will be listed on this website in the days to come. Check HERE for updates to our contributor list. Check HERE for our beautiful video. Check HERE for pictures that have been sent of Helping Hands decorating schools across the country. Thank you all! As of Today, December 30 2012 there are almost 2000 hands hanging in the new Sandy Hook School site at Chalk Hill! Spread the word to all who have participated...you have succeeded! The last week has been a whirlwind of activity. Volunteers have been working hours on end to create "hand quilts" out of the thousands of hands we received. We sorted hands so that each quilt would represent many schools, many cities, many people. We then took these beautiful quilts and filled the auditorium, cafeteria, stairwells and some hallways of Sandy Hook School at Chalk Hill. Our simple message has been posted along with the quilts: You are loved. You are safe. You are not alone. In the next few days, check back here for the complete list of participants. We've received packages from over 500 schools across the country and around the world! There will also be complete list of our wonderful Newtown volunteers, a combination of Sandy Hook alumni, retired teachers and their families. Many have e-mailed in the last few days wondering if they can still send hands. At this time we are wrapping up the Helping Hand project in Newtown. My suggestion would be to create your hands, decorate a section of your own school, and share the photos here. You may also email me photos you would like to share. Our email remains helpinghandsfornewtown@gmail.com. We have also created a Facebook page which you may access for pictures and videos. 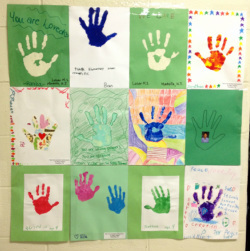 Thank you all for lending a hand to the Newtown community as it continues to heal.